Hello, well the first step to realizing my dream of building my own cob house is accomplished. 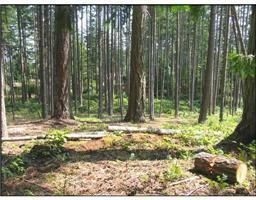 I found this very special property on Mayne Island last September. As of June 17th 2011 I take possession and I am so excited and grateful. There is a small trailer on the lot, with a big deck and an outhouse, all I need for a summer retreat until I gather materials and money to build my cob house. 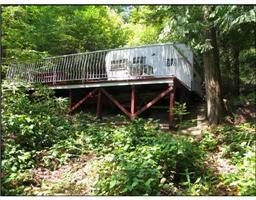 Here is the trailer and deck seen from below. 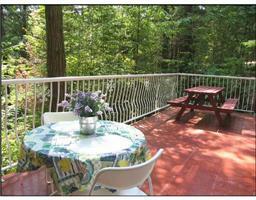 There is such a great deck for enjoying the view and fresh island air. 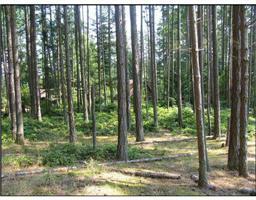 This is one of the potential building sites for my cob house. The bottom part of the lot, with such lovely trees and sunlight. Brilliant Pam, simply brilliant. You so deserve absolutely everything your beautiful heart desires. You are always 100% supportive of all you know and love. Can't wait to watch you progress. Amazing you are ! Many blessings still to come for you. thanks my wonderful friends, I feel your love all around me.